In an election year, such as this one, we are constantly bombarded with claims of what America is and what the country represents. We are reminded of how hard-working and resilient Americans are. Our country, we are told, is great because of something innate in our make-up, that we are special or, as some may believe, divinely appointed to be a beacon of light to the world. Often blinded by the myth of America, we justify or completely ignore the blemishes of our past. The ideal is all that matters. Entire populations are swept under the rug in order to keep the myth intact. we drew fresh water, the oil companies sucked oil. Will be tethered, and we will pay for air. Conflict Resolution for Holy Beings alternates between standard titled poems and untitled poems and prose poems. The interplay between the titled and untitled pieces creates a dialog, or even a call and response, between more commonplace and human subjects and a more universal and timeless voice. Once he took that chicken he wanted all the chickens. Once he took that corn he wanted all the corn. And once he took that wife, he wanted all the wives. Then he had a taste of gold and he wanted all the gold. Then it was land and anything else he saw. His wanting only made him want more. We lost track of the purpose and reason for life. We began to forget our songs. We forgot our stories. Or talk with each other around the kitchen table. Perhaps at its core, Conflict Resolution for Holy Beings is an attempt to reclaim the songs and stories of a people and to create new songs in the modern landscape. References to jazz are prominent in this book. While the form initially arose from African and slave folk songs, Harjo appeals to it as a language that binds people together. Jazz has it's roots in suffering, but it is also transcendent. It represents the America Harjo feels comfortable being a part of. 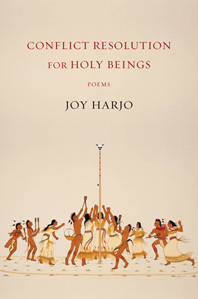 Although music plays an important thematic role, Harjo’s use of the song as a poetic form is not always successful. Lines like “I didn’t want to make the same mistakes. / I had to find my midnight star” (“Falling, Falling”) and “If you’ve found love in the circle then hold onto it, not too tight / If you have to let love go then let it go” ("Goin’ Home") seem trite and forgettable when surrounded by more original and meaningful poems. We laid down our burdens next to each other. Joel W. Nelson spent most of his childhood in the sub-Saharan countries of Burkina Faso and Cote d'Ivoire. He has an MFA in Poetry from Spalding University and lives with his wife and son in Louisville, KY. His poems may be found in the Bellevue Literary Review, the Found Poetry Review, The Louisville Review, and A Narrow Fellow.